There are numerous shoppers seeking a midsize sedan. Why? Because this car works on many levels, fitting the needs of a small family, a single person who logs plenty of miles, and seniors who can't commit to anything smaller than a midsize vehicle. Easing its way into the conversation these days is the attractive Hyundai Sonata. While previously it couldn't hang with the class leaders, it was still a smart choice for folks who wanted to save money and loved the Hyundai drivetrain warranty of 10 years or 100,000 miles. These days the 2015 Hyundai Sonata might not be on top, but it's not far from it. And that's saying a lot considering its prime rivals are the Honda Accord, Toyota Camry, Ford Fusion, Nissan Altima, Mazda 6, Chevrolet Malibu, Volkswagen Passat, and the Kia Optima, a cousin of the Sonata (Hyundai and Kia production is closely related). 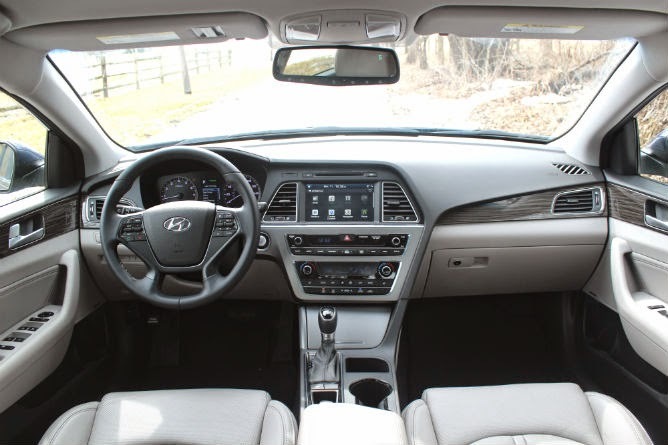 The Sonata remains at an affordable price and still can be characterized as delivering a lot of bang for the buck. It's a sedan that provides strong performance with a choice of three engines, delivers solid gas mileage (ranging from 25-38 mpg), offers top-notch safety, rides with comfort, and features a sizable list of standard features. Looking for improvements, Hyundai redesigned the popular Sonata for 2015. The focus was not on altering the design (new taillights is the only major change), but more on interior refinements and adding a new 1.6-liter, turbocharged four-cylinder that delivers good gas mileage (28-38 mpg) and surprisingly good performance. There are two other engine choices for the Sonata. The standard model that powers the SE, Sport and Limited is a 2.4-liter, four-cylinder that produces 185 horsepower and 178 pound-feet of torque. The Sport 2.0T is a turbocharged 2.0-liter, four-cylinder with 245 horsepower and 260 pound-feet of torque. Even though it sounds impressive, some drivers might not like that the 2.0T only goes 0-60 mph in 8.3 seconds. A definite plus for the new Sonata is its quiet ride. 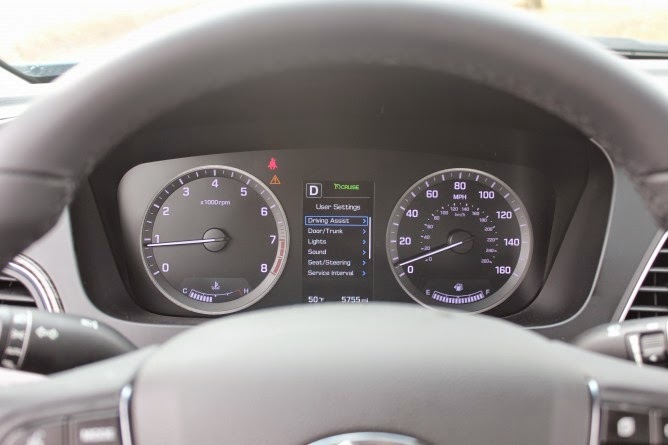 Several auto reviewers have written that the Sonata cruises along in "utter silence." The Sonata also has other fine qualities like good braking, confident handling, and smooth ride. 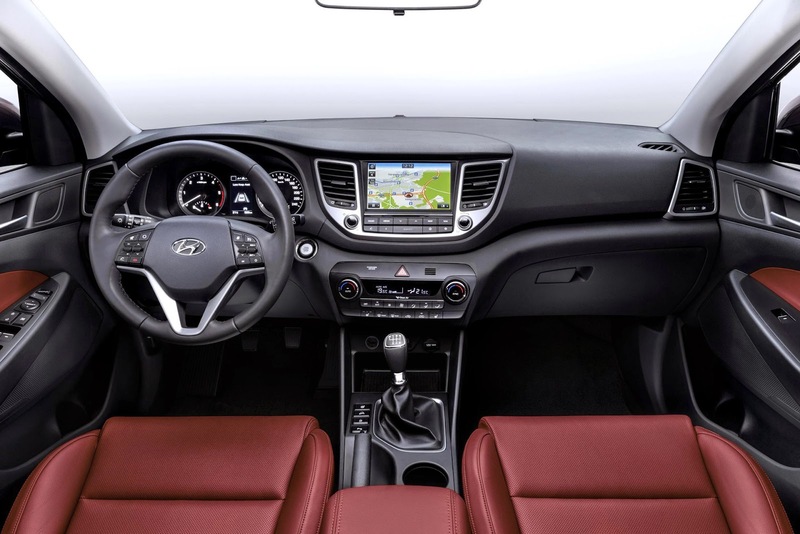 The Sonata interior also receives high marks. The 2015 model offers more interior room and can easily accommodate four adults. 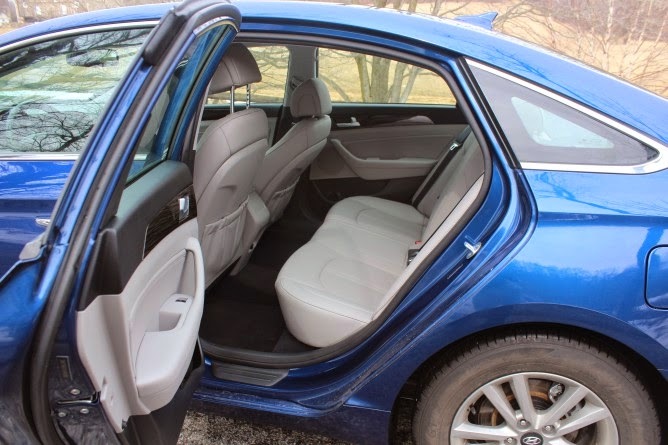 Additional leg room is now available in the back seat, but head room can still be confining for taller individuals due to the sweeping roof line. The trunk space is 16.3 cubic feet, which is a little more space than the average midsize sedan. There's nothing complicated with the Sonata control layout. It's straightforward, a good thing for people who find it annoying when an intuitive design is not part of the plan. Climate controls are clear-cut and so is the touchscreen interface. Perhaps we've saved the best news for last: cost. The Sonata has five trim models (SE, Sport, Eco, Limited and Sport 2.0T) with a starting price of $21,150, which is around $800 to $1,275 less than a Honda Accord or Toyota Camry. Note that the Sonata price can climb rapidly to a peak of approximately $33,525. Whatever the model choice, Sonata offers lots of value for the price. HOLYOKE — In the latest zoning battle here, a public hearing will be held Tuesday (March 31) on a bid from Gary Rome Hyundai to build a dealership on Whiting Farms Road. The City Council Ordinance Committee and the Planning Board are holding the hearing at 6:30 p.m. at City Hall. The company has a deal to buy the vacant 18.7-acre site — previously eyed by Walmart and Lowe’s Home Improvement — from the Holyoke Gas and Electric Department (HGE) for $2,050,000. But the sale is contingent on Rome succeeding in a petition to change the zoning designation of the property to Business Highway, which would allow an auto dealership, from the current Business General, which prohibits such a business. Gary Rome Hyundai currently is at 1000 Main St. here. “The development of this site as a motor vehicle dealership will result in the creation of significant number of new jobs, employment opportunities and income/property taxes that will benefit the city of Holyoke and its residents,” Rome wrote in the zone-change petition filed with the city clerk Feb. 10. Neighbors and others who belong to a group called HolyokeFirst have said they oppose a car dealership on the property on the grounds the street already is busy with traffic and such a business would be too intrusive. The site is on the part of Whiting Farms Road across from Autumn and Lynch drives near the Holyoke Mall at Ingleside and Barnes & Noble. Some of the residents also fought the Walmart plan in 2013 and the one from Lowe’s in 2009. HolyokeFirst members have said they would rather see a mix of uses on the Whiting Farms Road property they see enhancing the neighborhood. But HGE Manager James M. Lavelle has said a commercial zone is better for the property to keep it marketable. The Ordinance Committee and the Planning Board can make recommendations. But the decision to grant or reject a zone change is the responsibility of the full City Council. Approval of a zone change requires a two-thirds majority, or 10 votes, of the 15-member council. But a vote on a zone-change request usually occurs only after weeks, if not months, of deliberations. The Gary Rome Hyundai zone change bid comes as the City Council gears up for a vote on April 7 that could decide a more than four year dispute on whether to designate an area on Lyman Street as a Polish Heritage Historic District. The council dealt with another controversy March 17 by rejecting by a single vote a petition for a zone change that the Greater Holyoke YMCA needed to install a parking lot at Pine and Appleton streets. Walmart withdrew its proposal to build a “supercenter” on the Whiting Farms Road property in September 2013. A spokesman said the retail giant retreated because tests showed soil contamination, not because protests against the retailer were so vocal. Lavelle has said any contamination was minor, the property never having been occupied, and easily cleaned up. In December 2009, Lowe’s dropped a plan to build a $15 million facility on the Whiting Farms Road property because of the poor economy, officials said then. Hyundai ushers in a new era for its world-class premium product range with the recent unveiling of the all-new second-generation 2015 Genesis sedan at the North American International Auto Show in Detroit, Michigan. With a single-minded focus on delivering the driving and ownership experience expected of the best premium sedans in the world, Hyundai has redesigned the Genesis from the ground up with bold styling, cutting-edge technologies, and exceptional driving dynamics. Originally introduced in 2009, Hyundai’s signature “Fluidic Sculpture” design language has since influenced every model in the brand’s line-up. The all-new 2015 Genesis is the first Hyundai product to feature the styling theme’s second generation, dubbed Fluidic Sculpture 2.0. While fluidic forms remain the core of the design language, they’re presented in a more refined and simple manner. Adaptable to the company’s entire product range, Fluidic Sculpture 2.0 will give all Hyundai products a consistent modern aesthetic and a premium overall feel. The 2015 Genesis will be the first Hyundai model to incorporate the brand’s all-new HTRAC all-wheel drive (AWD) system. Developed to offer consistent all-weather traction while improving the vehicle’s dynamic behaviour, HTRAC underwent extensive testing at Germany’s Nürburgring Nordschleife race track, Korea’s Yeongam Formula 1 racing circuit, and Hyundai’s California Proving Ground. Weighing just 61 kilograms, HTRAC distributes power through a variable torque split clutch. HTRAC is controlled in part by the Genesis’ new drive mode system. With the vehicle set in “Normal” mode, HTRAC defaults to a 40:60 rear-wheel biased torque distribution. The system can shift as much as 90 percent of engine output to the front axle in slippery conditions or 100 percent to the rear at higher speeds for reduced driveline drag and improved fuel economy. When the vehicle’s “Sport” mode is selected, HTRAC’s response is modified to counteract understeer and oversteer by sending power to the front or back as required. At speed in Sport mode, HTRAC gives Genesis a rear-wheel drive character by sending 80 to 90 percent of power output to the rear wheels. Genesis will offer a choice of revised 3.8-litre GDI V6 and 5.0-litre GDI V8 engines for 2015. Each receives a series of enhancements aimed at improving low-end torque, driveability, and fuel economy. Now developing an estimated 311 horsepower and 293 lb-ft of torque, the 3.8-litre “Lambda” V6 receives better breathing by way of a new 3-stage Variable Induction System (VIS). 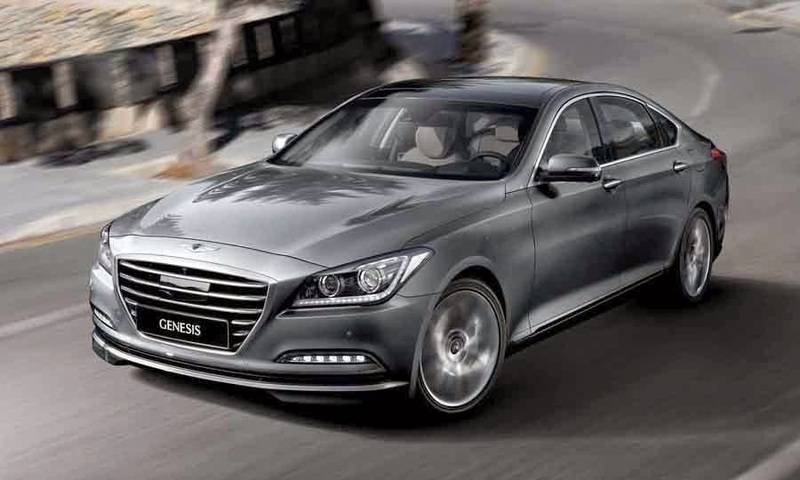 The 2015 Genesis is underpinned by an all-new platform incorporating 38 percent more advanced high tensile-strength steel than its previous-generation counterpart. Torsional and bending rigidity have been increased by 16 and 40 percent, respectively, surpassing the BMW 5-series in both measures. The structure of the vehicle was engineered to meet the most stringent international government and independent agency safety standards. Genesis models equipped with the 5.0-litre V8 receive a Continuous Damping Control (CDC) suspension capable of automatically adjusting its damping rate based on road conditions and the drive mode selected. The suspension is calibrated for superior ride comfort in Normal, Eco, and Snow modes while Sport mode firms the damping rate for enhanced handling precision and control. Genesis features Hyundai’s first application of Rack-mounted Motor Driven Power Steering (R-MDPS) which can vary power assistance based on readings from an integrated torque sensor. To balance high speed stability with direct response at lower speeds, Genesis uses a Variable Gear Ratio (VGR) system. All elements in the steering rack have been calibrated to offer accurate feedback and responsive handling behaviour. Genesis comes standard with 18-inch alloy wheels and 245 millimetre section width tires at all four corners. Staggered fitment 19-inch alloy wheels with larger 275 millimetre section width rear tires are equipped on 5.0-litre V8 models to improve power delivery. The vehicle’s new alloy wheels are stronger and more resistant to deflection forces for more precise response to changing road surfaces. Stopping power is provided by four-piston fixed front brake calipers and large 345 or 360 millimetre rotors for V6 and V8 models, respectively. Last June following its April introduction of the seventh-generation Sonata lineup, Hyundai offered a counterpoint to the still-pending – but since revealed Hybrid – the Sonata Eco. What makes an “Eco” an eco, and how economical is it? As you’ve guessed already, it’s not a hybrid, but instead taps a trend we’ve seen elsewhere – a downsized and turbocharged engine – and this is the only Sonata that gets a seven-speed dual clutch automatic transmission. The lower-price-point 1.6-liter turbo alternative comes as a package priced $100 more than the second-cheapest 2.4-liter non-turbo Sonata Sport trim level, and nets three mpg better rated combined fuel economy. Why is the Eco here? Hyundai says it is experimenting with the relatively inexpensive, lighter, somewhat more technologically advanced alternative to the SE and Sport trim levels of the Sonata and it does have a certain appeal. 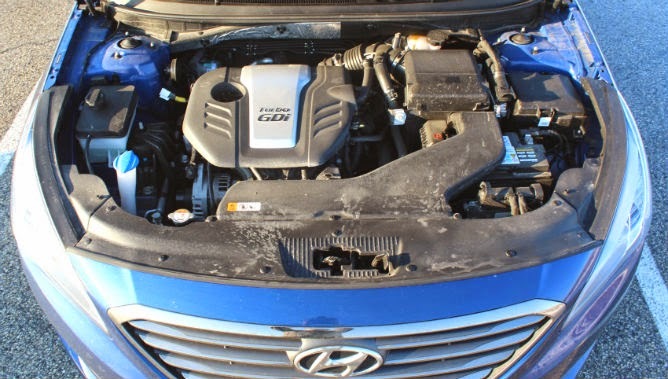 Similar in principle to other carmakers’ smaller but potent and efficient turbocharged engines, Hyundai’s 1.6-liter four-cylinder Eco has the lowest displacement among Sonata siblings. But, with forced induction, direct injection, and more torque than the 2.4 naturally aspirated fours, its go-power is enough. Specifically, estimated output is 178 horsepower at 5,500 rpm and torque is 195 pounds-feet from 1,500-4,500 rpm. The seven-speed dual clutch transmission adds an extra ratio over six-speeders in other trims – including the hybrid – and the DCT is more efficient and engaging than CVTs. The $24,085 Eco is an upgrade over the base $21,960, 2.4-liter Sonata SE, adding a chrome grille, side mirror-mounted turn signal indicators, and automatic headlights. It nearly ties the 2.4-liter Sport trim’s price, is $3,300-$10,200 less than higher Sonata trim levels, and so does fit the “economical” moniker in that respect. Also included above SE spec are 10-way power driver seat with lumbar support plus stitching on the instrument cluster hood, chrome interior door handles, 5-inch color touchscreen audio, rearview backup camera and Blue Link telematics system. Otherwise, the Eco is visually similar to the other Sonatas with curb weight – depending on options – 235-318 pounds lighter which contributes not only to fuel economy but along with the rather sophisticated transmission, adds to driving dynamics just a touch. 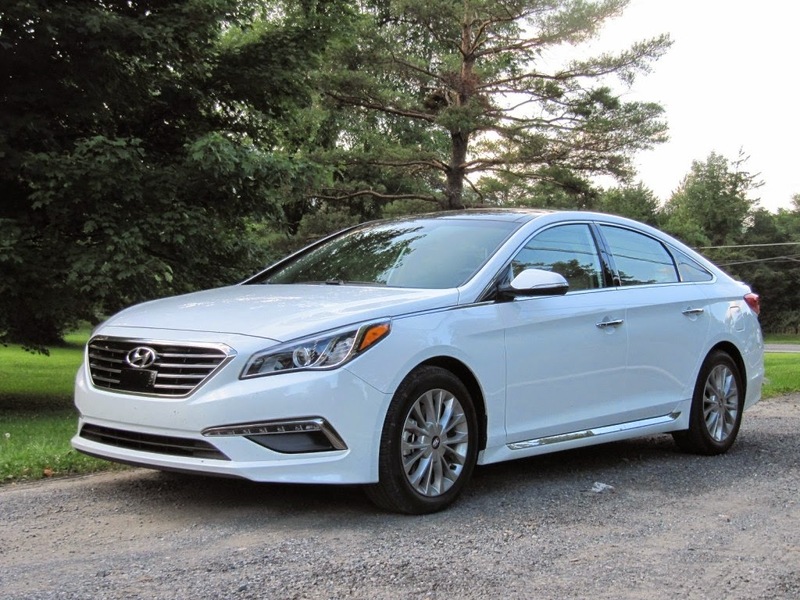 Aimed squarely at those who might otherwise go for a Honda Accord, Toyota Camry, Nissan Altima, Mazda 6, Ford Fusion, Kia Optima, or Chevy Malibu, Hyundai has its work cut out for it but its evolved Sonata rises to the occasion. Fact is, so many cars have gotten better, they are becoming like commodity items distinguished by a crease here, a swoop there, a daring line here. 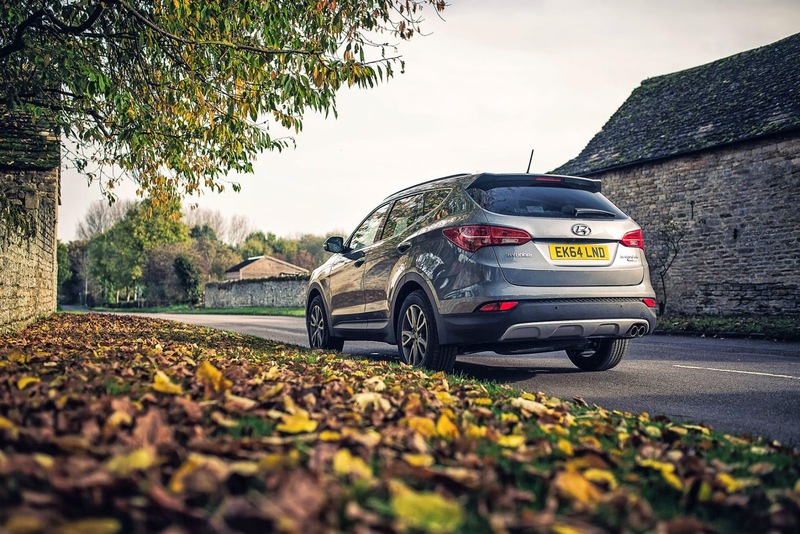 So it’s the finer points you’ll be straining through, and we can tell you the Hyundai fits right in – or blends right in – as a variation on the theme. In this case, it’s positioned as bordering on elegant in a few points, down on a couple others, and value priced all at the same time. Its $1,100-$1,900 price spread is not as dramatic between established Japanese models as it has been in years past. 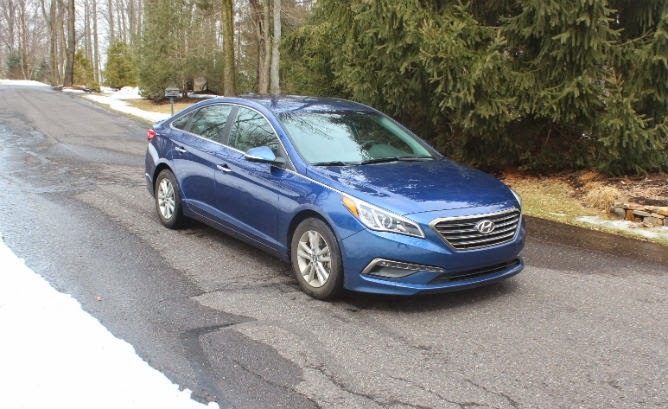 Hyundai has come a long way from its second-class status over a decade ago with elements of its Genesis model blended into this new Sonata the EPA calls a “large” class vehicle. The redesigned Sonata’s proprietary design language is officially called Fluidic Sculpture 2.0. This is actually a rethinking of version 1.0’s swoopier youthful-esque 2009-era design thesis intended to make vanilla family sedans come across as coupe-like, more fun and sporty. The new look continues the theme while toning it back a bit with balance and proportion all the way around. Nice little touches like inside door handles with effortless engagement and other details show Hyundai is vying for full Class One perception. Inside gauges are laid out sensibly, angled toward the driver, and materials are of acceptable if not bordering on upscale quality such as the nice imitation wood veneer on the dash and door panels and a mix of soft touch and harder materials stragically located. The main option, a $4,100 technology package is available to add to the base Eco and came with our test car. This comprehensive suite includes leather, heated front seats, dual temperature control, 4.2-inch color info screen, premium audio, SiriusXM for traffic info, etc., and auto up/down passenger windows. It also adds Blind Spot Detection with rear-cross Traffic Alert and Lane Change Assist, and an 8-inch navigation system with voice command, HD Radio, and more including Apple Siri integration, and Wi-Fi for downloading apps. Small but appreciated details as well include chrome exterior door handles with “welcome light” (nice LED puddle lamps), hands-free Smart Trunk Auto Open and proximity key entry with push-button start. As true for all Sonatas, passenger space is roomy enough, with 45.5 inches front and 35.6 inches rear leg room in the large-class sedan. Outward sightlines are clear with reasonably thin A and B pillars. Cargo capacity of 16.3 cubic feet is largest-in-class for handling suitcases, groceries, or whatever else. There’s nothing really to gripe about. It’s tastefully done, if not still a bit vanilla – which may be what many buyers precisely want – and it does the job. Shared with all the new Sonatas, the Eco gets a chassis built with high-strength steel comprising more than 50-percent of its total platform. Hyundai says this creates 41-percent stiffer torsional rigidity and 35 percent greater bending strength. What that means is the vehicle drives nicely around bends although the low rolling resistance tires do not provide as much cornering or braking grip as would higher-performance rubber on other trim levels. Bump attenuation however is compliant. Hyundai uprated the rear multilink suspension for control and cornering improvements and the arrangement includes dual lower suspension arms in place of the outgoing single-arm design. Steering feel is not especially sensitive but reliable and predictable from the electronic power steering unit. Acceleration is respectable and 0-60 mph has been recorded at fractions above seven seconds. On-road passing power is good too, but from a standstill there can a slight lag from the electronically controlled DCT and low-end torque from the engine – while higher on paper than the 2.4-liter’s 178 pounds-feet – is just sufficient. 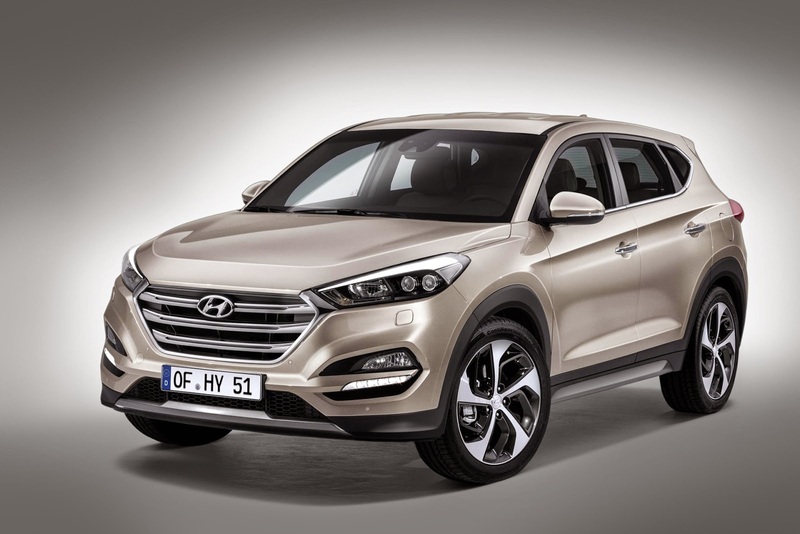 Hyundai said reducing noise, vibration, and harshness was a priority and the vehicle is acceptably hushed. On the boil however, the engine is not as sweet sounding, say, as an engine from an Accord, although it is not actually rough by any stretch – just not as silky. The DCT is otherwise a superior device over a conventional automatic and for those who dislike CVTs, this car could be your cure. As for fuel economy, while Hyundai has caught heat in the past for discrepancies between real-world and estimated economy, it seems to have repented of its former errors. The Eco was capable of meeting EPA ratings of 28 city, 38 highway, 32 combined under sedate driving. Give it a heavy foot however, and expect like with any car to see the idealized numbers not met. The $24,085 (including $810 destination) Eco is a clear alternative to the $21,960 SE and $23,985 Sport trim levels for shoppers looking for a solid all-around family sedan without much pretense or need for sub-six 0-60 times. By U.S. EPA estimates, the Eco could save an average driver $500 over five years compared to these cars rated 3 mpg less combined but only 1 mpg less on the highway. Compared to the 2016 Hybrid not for sale yet, it’s well short of that car’s 41 or 42 mpg combined estimate which the EPA says could save an average driver $1,750 in five years over the Eco. Hyundai has not priced the 2016 Sonata Hybrid or its plug-in hybrid variant yet, but the base Hybrid could be close to the 2015 Sonata Hybrid’s $26,000 range. Frankly, it’s a close call and this is a tight field which we said up front splits hairs. All told we like the Eco. As an evolved product with unique attributes and latest internal-combustion engine and transmission tech, it does make an arguable alternative. Santa Fe, New Mexico, population 70,000, America’s oldest state capital. What does this have to do with a medium-sized Korean SUV? Not a lot, except that the very wise folk at Hyundai correctly reasoned back in 2000 that the way to break the North American market was not to launch a car called Changwon or Uiwang. 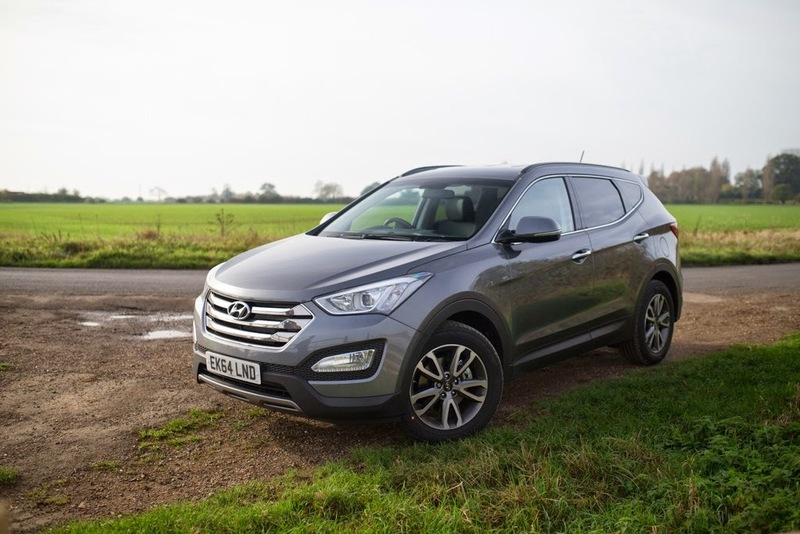 Their wisdom was ratified by sales success in America, and even though they didn’t change the UK model’s name to Leamington Spa, we Brits kind of got the Santa Fe too. We’ve bought 37,500 of them since 2001, and snaffled 4200 last year alone. 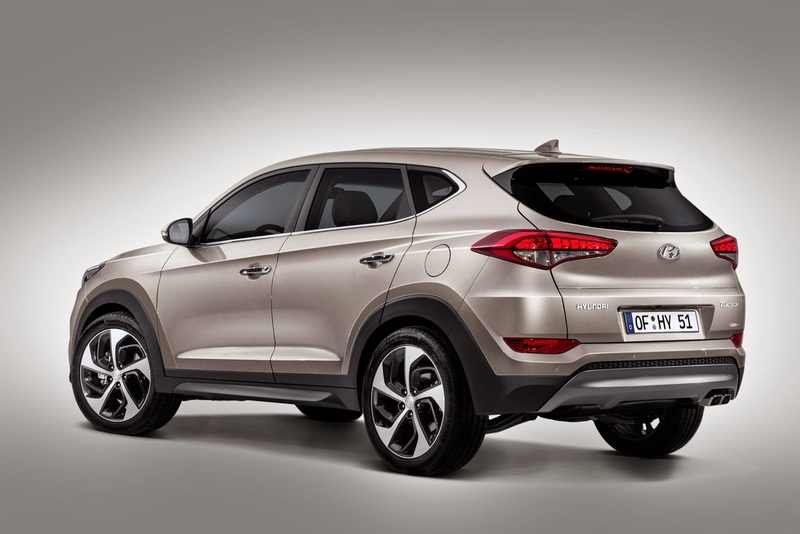 Here we have the third-generation model, confusingly dubbed ‘New Generation’, which adds to the Santa Fe’s established good-value/robust/unfussy DNA a good deal more technology and an aggressively chromed-up, Yank-tank belligerence around the jawline. As one of the bold new breed of stylish Koreans it succeeds in making premium Germans look rather plain and the Japanese a little tired (though having seen off the Freelander it will have sleepless nights over the arrival of Land Rover’s spangly Discovery Sport). Battles to come. Our car’s ‘Premium’ badge means it’s the current five-seater range sweet-spot (the Premium SE gets two extra seats and inessential lush goodies), and the kit list is so comprehensive we’ve only managed to add a paltry £585 to the base price – that being the cost of ‘titanium silver’ metallic paint. Which means we’re on the road for £32,315 – slightly less than an equivalent Honda CR-V, slightly more than a Toyota RAV4 and heaps cheaper than a decent Freelander 2. So, while Hyundai doesn’t own value, you’ll find it rolling up its sleeves with gusto when they shoot the mid-market SUV fight scene. Credible stuff then, but in the corner of the room an elephant lurks. Why are we running a Santa Fe? It’s not a car that’s only just been launched, it’s neither the best nor the worst nor the cheapest nor the most desirable car in its class, and keen drivers will dismiss it as if it had just handled on the goal-line. It’s all my fault really. Since driving the very first Santa Fe on its launch back in 2001 I’ve held the view that unfashionable SUVs are often hidden gems, shielded from readers by a mix of snobbery, tradition and road-tester bravado. Take a poll of 50 motoring journalists and find out how many would take an inferior Land Rover over an uncool Santa Fe. 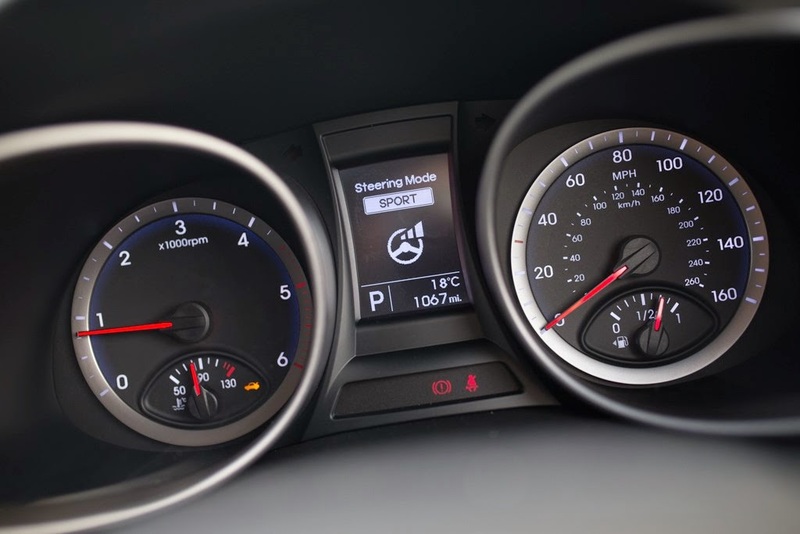 Yes, of course you get more steering feedback from a Freelander than from this Hyundai, whose variable power-steering system (called FlexSteerTM) is more numb than a Sherpa’s nose, and yes the Santa Fe’s 2.2-litre diesel engine’s mantelpiece is empty of awards for power delivery or refinement. But with 311lb ft of torque it pulls like Benedict Cumberbatch at a mums’ speed-dating evening which, added to the likely benefits of reliability and low running costs (the five-year warranty includes five years of roadside assistance and an annual vehicle health check) nicely richens the mix. So, in my role as official bucker of trends (at least, I think they said ‘bucker’) I’ve decided to sample the case for middle-market solidity and the unfashionableness for which I’m well suited. Is This The New Hyundai Elantra?